Located on Deck 2, these suites feature a spacious seating area and a generous 240 ft² / 22 m² with private facilities. Located on Deck 3, the suites offer a large picture window, generous sitting area and 225 ft² / 21 m² of space with private facilities. 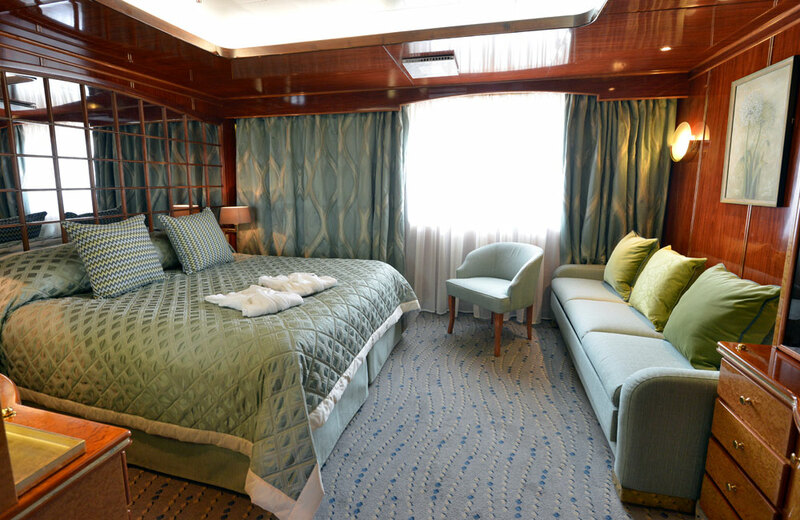 Located on Promenade Deck, these suites feature a large window and comfortable sitting area. Suite measures 220 ft ² / 20.4 m² with private facilities. Located forward on the Promenade Deck, these suites offer forward and side windows, a generous sitting area and 240 ft² / 22 m² of space, including private facilities. Located on the Veranda Deck, these suites offer a private balcony and sitting area, measuring 260 ft² / 40 m², including private facilities and a 40 ft² / 3.7 m² balcony. Located on the Penhouse Deck, these suites offer 385 ft² / 30 m² of living area including a sitting area, private facilities and an 80 ft² / 7.4 m² private balcony.